1958-59 Topps Hockey is the company's third hockey set. It was also the first time they made sets in consecutive years. As the second of seven straight years with 66-card sets with only some of the teams represented, the 1958-59 Topps Hockey stays securely within its formula. However, the stars really aligned to create one of the hobby's true legendary cards. 1958-59 Topps Hockey card fronts feature a player picture superimposed over a two-color background that is divided diagonally. The player's name appears above his head, and his team and position appear in a solid-colored stripe that extends below him. A white stripe surrounds the card. The backs are dominated by a green box. Above the box are a dark circle with the card number, the player's name, position and team. The box itself begins with a single line of statistics from the previous season. The rest of the box contains a player biography written into two parts: the left side has the paragraph in English and the French translation is on the right side. A cartoon at the bottom appears next to a caption about the featured player, which is also bilingual. The set is limited to just the NHL's four American teams at the time: the Boston Bruins, Chicago Blackhawks, Detroit Red Wings and New York Rangers. 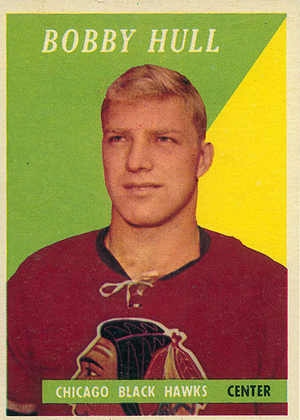 The set's cornerstone is the rookie card of Bobby Hull. Not only is the card the first appearance of a hockey legend, it's also the final card of the set. It's tough to locate without centering issues. All these factors combine to make it a truly valuable card. Other key rookies in 1958-59 Topps Hockey include Eddie Shack and Ken Wharram.